It’s not really surprising that newly adopted young greyhound Max panics when left alone. I’m sure he was a useless racer – good for him because it’s given him such a great reprieve! The two-year-old has spent all his life in kennels. Now he lives in a house with a young couple. It’s quite amazing how well they have done in just six weeks, integrating him into life living with people in a home. For the first weeks he paced and panted, showing anxiety in general as he became acclimatised. Now he has settled down beautifully…. The two sighthounds barely lifted their heads from the sofa when I entered the room. I could hardly believe it when I rang the doorbell and from a house with three dogs there was no barking at all – not even from their elderly Springer but she may be a bit deaf. When I entered the room both sighthounds were on the sofa. I don’t know if Rosie even opened her eyes. Eamonn, curious, got down from the chair, stretched his long body in the way that sighthounds do and calmly came over to investigate me. His long, intrusive greyhound-like nose explored my work bag. Rosie, a stunning Saluki mix, seemed unusually quiet and motionless. They say she is aloof and it’s hard to decide if this is all or whether she is also keeping her head down so to speak. She lives with the very polite and calm Eamonn, a Sloughi mix from Ireland (no, I hadn’t heard of a Sloughi either – a North African breed of Sighthounds found mainly in Morocco). 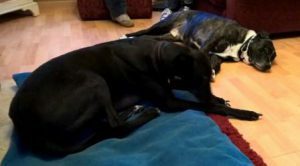 Both dogs are failed fosters – and I well understand why. They are sensational. The people are experienced dog owners and fosterers of sighthounds in particular. They have watched many of Victoria Stilwell’s videos and because I am one of her UK VSPDT trainers I have the privilege of working with them. Sometimes it is necessary to get objective and experienced outside input. 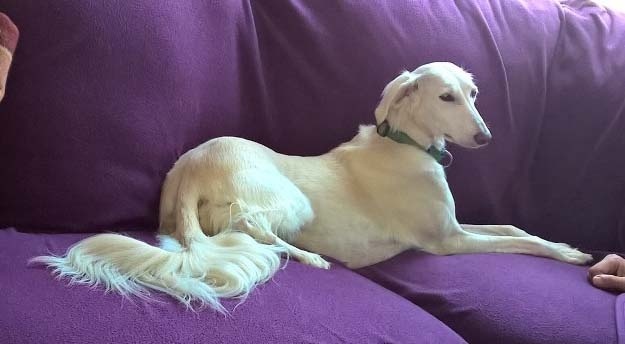 The family has had the two sighthounds for around a year. Rosie, now five, had been used as a puppy-making machine in Wales and then dumped by the roadside when she was no more use to them and Eamonn, now about two, had been in another sad situation. Seeing both dogs now it’s hard to believe either had known anything but love. Some months later they fostered another dog. 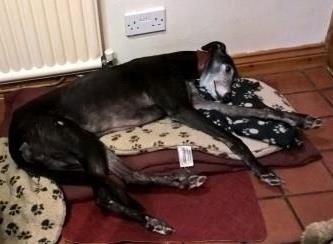 All was well with both sighthounds until another foster, a female, came to live with them for about five months. With this particular foster dog in her home, Rosie became increasingly tense and unhappy. The dog was needy and attention-seeking and this instability upset Rosie. Unfortunately her aggressive attitude then spread to antipathy to other dogs that they met when out and Eamonn was sucked in also. They feed off one another. Before the other dog came, both sighthounds were mostly fine with other dogs. Now they are walked with muzzles. Rosie is a bit of a Jekyll and Hyde. When she is let off lead with Eamonn this quiet and poised dog can totally change. She goes crazy – charging around in circles, stirring herself up into such a high that she then redirects aggressively onto Eamonn who becomes quite scared and hides. Why is she suddenly so aroused? Where has all that stress come from? It’s like she erupts. To me it suggest that though otherwise so quiet and undemanding, there must be more going on inside her. The regular encounters with other dogs when out, although already being worked on to some extent, may be contributing to well-hidden stress levels. 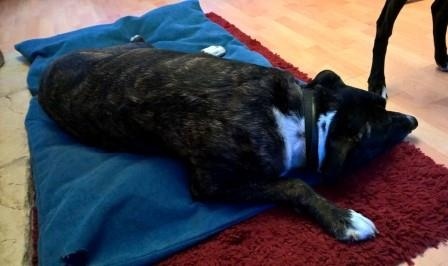 The foster dog has now moved on and Rosie is altogether much happier again in her own, introverted sort of way. They say they would like her to play but I suspect she’s not psychologically able to abandon herself to proper play. The two main issues we are dealing with are Rosie and her reactivity to other dogs (Eamonn is fine without Rosie there) and Eamonn’s running off, maybe for a couple of hours, if he spots something to chase. They will only walk the two dogs separately for now in order to concentrate on Rosie’s over-arousal of which there is no sign at home and her reactivity to other dogs, and on Eamonn’s recall. In a way both Rosie’s attitude towards dogs (with a barking neighbouring dog to bark back at) and Eamonn’s prey drive (pigeons in the garden to wind him up) are behaviours being rehearsed at home. They can take advantage of both these ‘problem’ situations by using them to create new strategies to use when out. Sighthounds can spot potential prey from a great distance. The only way to prevent them running after something apart from having them restrained on a long line is first to train an immediate alternative reaction that redirects their instinct to chase onto something else. Once the focusing on the prey has broken into the chase stage it may be too late. 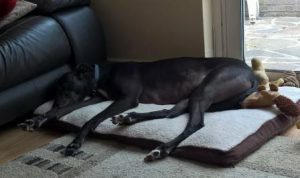 They will take it slowly with Rosie, doing their very best to make sure she doesn’t get closer to another dog than she feels comfortable whilst working hard to gradually decrease that distance by giving her choice and creating positive associations. It’s important meanwhile that there are no unexpected and uncontrolled encounters. Here is why. 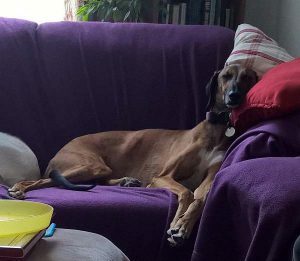 Last year they took their two beautiful sighthounds on holiday where there were lots of other on lead dogs and they want to go again later this year. With hard work they will hopefully get Rosie back to her old self in time so they can all walk down the streets together as before. Whether marking or anxiety through being left, the root cause will be Herbie’s feeling of insecurity. Greyhounds have hidden depth. It’s easy to assume that because five-year old Herbie lies around quite a lot and appears peaceful and a bit lazy, that he’s calm inside. I noticed a lot of jaw-chattering that is usually associated with stress of some sort, along with yawning and lip-licking. In Herbie’s case, it seems that it’s not ‘stress’ necessarily in an anxiety sense, more slight arousal. He loves a cuddle – seeking the affection himself – but his jaw may still chatter. He’s a very friendly boy and gave me a happy but polite greeting, very curious to smell my own dogs on me. The signs that there is more going on inside him than most people might immediately notice, however, is one big clue as to why, over the past few months, Herbie has taken to peeing in the house. He is a retired racing dog they have had for eighteen months. At the time the couple were both out all day at work and they had a tight routine. There was no marking or peeing indoors at the time. Then came a lot of upheaval. The lady took maternity leave which meant Herbie had company much of the time but her comings and goings were unpredictable. They had extensive building work done opening up the house which at times upset him so much he had to be shut in a bedroom. This is when the trouble started. Then six months ago the baby arrived. The toileting indoors is now becoming a real problem because the baby will soon be on the move. Initially the ‘marking’ could be anywhere in the house and not necessarily when the couple were out and seems to stem from all the change making him unsettled. Initially I felt this might have been marking ‘his’ territory, scent marking anything new that was erected or appearing in his house. More recently, though, the weeing has only happened when he has been left, and nearly always it is in the same place – by the window from which he watches them disappear down the garden path. The next question is whether it’s because he doesn’t like being left all alone per se, whether any company is sufficient, or whether is he pining for the lady in particular and to whom he’s closest. Possibly he actually feels that it’s the lady who needs him, and that he should be keeping an eye on the baby? The only time he has shown any aggression has been when a large dog rushed up to the buggy. Another questions is, does he pee immediately as he watches them go or some time later? Answers to these things can affect how we approach the solution. They will video him. During the week the lady may go out a couple of times a day with the baby, and nearly every time she comes home to a puddle in the same place, on the rug by the French windows. At the weekend the couple will go out together. I suggested they tried the man staying behind with Herbie while the lady takes baby down the garden path, then five minutes later he joins her. If this improves things, we know the lady must then work on the dog’s separation specifically from herself and possibly the baby. The dog disturbs them in the night also, going upstairs and whining – probably waking when he hears them get up to the baby, and this is disturbing their nights even more. They eventually take him back down again and nearly always find a puddle in the morning. It’s only since the building work that he has gone upstairs at all. They want him to come up in the morning only now. My feeling is that they need to be consistent and start to set up some solid boundaries and routines again – as they had when he first came to live with them. They can once more stop him going upstairs. The house wasn’t open plan before and Herbie was more contained. I suggest they gate the front part of the house from where the stairs lead during the day. They can first do this for a couple of days so he gets used to more restriction before shutting the gate at night. This then gives the lady lots of opportunity to depart from Herbie, taking baby with her. He won’t be able to follow her everywhere – good preparation for leaving him when she goes out. If she drops a couple of bits of his kibble over the gate each time she leaves him behind, over time he should be associating the sight of her walking away from him with something good. What’s more, these short indoor departures will reinforce to Herbie that she always comes back. Separation issues can take time and patience to conquer. In Herbie’s case there could well be a bit more to it. With insecurity being the real problem, it’s his feelings of insecurity that need to be addressed. NB. For the sake of the story and for confidentiality also, this isn’t a complete ‘report’ with every detail, but I choose an angle. The precise protocols to best use for your own dog may be different to the approach I have worked out for Herbie. Finding instructions on the internet or TV that are not tailored to your own dog can do more harm than good. One size does not fit all. If you live in my own area I would be very pleased to help with strategies specific to your own dog (see my Get Help page). Alfie is a seven-year-old Mastiff Staffie mix who spent the first eleven weeks of his life in a shed with other dogs but no human contact. When they picked him up he was riddled with worms, had mange and colitis. He was a very sick puppy with no socialisation whatsoever. It’s hardly any wonder that, despite supreme efforts on their own part without which he would undoubtedly be a lot worse, he has grown to be a dog wary of people and insecure about being left. 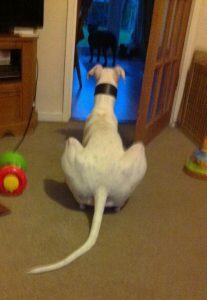 They have since adopted a greyhound, Kenny, who gives him a bit more security when the dogs are left alone. When we arrived and he was let in the room to join us, Alfie was immediately barking at us. I tried gently rolling a piece off food towards him which he broke off barking to eat. That was a little clue. If he was really as upset as he sounded he would not have taken the food. He’s been doing this behaviour for seven years so some of it may well be learned behaviour – a habit. Although he sounds fierce, he has never bitten anyone. We continued to roll food at him until he was eating from our hands and being touched. Fortunately he is a very food-motivated dog. I suggested they now keep back much of Alfie’s dry food for him to earn – and also that they feed him better food. To quote Pat Miller in The Whole Dog Journal, ‘Poor quality protein can interfere with a dog’s ability to make use of the serotonin that occurs naturally in his system. Serotonin is a neurotransmitter that helps regulate mood ….. Foods containing high-quality protein can contribute to your dogs’ behavioral health and physical health’. After a while I stood up and it started Alfie barking again, but he soon relaxed as I dropped food whilst standing. The plan will be for anyone who comes to the house to gradually, using food, go from sitting, to standing and then to walking slowly about whilst dropping his food. Gradually the food can be reduced and ultimately stopped altogether. It’s not only people coming into their house which can cause Alfie to bark ferociously. He also barks at the young son who is unable to go up and down stairs freely without someone first grabbing Alfie and putting him into the kitchen. The couple themselves are unable to go upstairs together without Alfie creating – unless the man goes first and the lady follows a bit later. The dog is ruling their lives. The son can never have his friends to stay. I suggested the boy got up and walked out of the door towards the gated stairs, dropping food as he went. No barking. He carried on up the stairs, throwing food over onto the floor. On the way down he did the same thing. I had him doing this over and over. No barking. He can gradually feed less and on the way down he can later wait on the stairs for Alfie to be calm and quiet before throwing one bit of food and continuing down – changing over from desensitising him to rewarding him for being quiet. Slowly Alfie’s panic at the boy leaving and going upstairs – whatever the reason – should disappear as it is associated with something he likes – food, and at the same time the habits of his lifetime will be broken. I take a ‘holistic’ approach, so over the next few weeks there are several other things the family should be putting in place so that Alfie becomes a calmer and less insecure dog in general. Normally he is constantly pacing and looking for trouble. It was great to see him lie down and relax several times while we were there, demonstrating by our own behaviour and by ‘conducting’ the behaviour of the other people, that he can do it if the humans around him do things in a different way. NB. The precise protocols to best use for your own dog may be different to the approach I have planned for the complicated Alfie, which is why I don’t go into exact detail here of the methods to be used. Finding instructions on the internet that are not tailored to your own dog can do more harm than good. One size does not fit all. 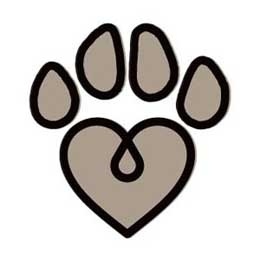 If you live in my own area I would be very pleased to help with strategies tailored to your own dogs (see my Get Help page). Six weeks ago Greyhound Jo was a happy dog, if somewhat quiet and sensitive. 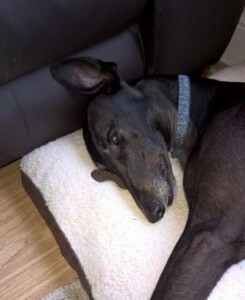 She is a six-year-old ex-racer who has lived with the elderly lady for over a year now. Then, one day, she and her elderly lady owner came back from their usual morning walk and Jo stood outside the back door and refused to move. Why this happened is anyone’s guess. So far as the lady can remember there was nothing out of the usual in the house or in the doorway, and nothing untoward had happened on the walk. How the lady reacted was, she admits with hindsight, unfortunate. She got cross and shouted at the sensitive dog, then tried to drag her in by her collar – finally lifting her and forcing her through the door. Things have gone downhill since then. Every time they have been out Jo simply refuses to come in. Fortunately the lady knew what she did was the wrong way to go about it and wasn’t cross again. She has since tried to cajole her through the door, unsuccessfully. she shuts her out and five minutes later when she opens the door the dog flies in. Hugging the wall, she shoots right round the kitchen dining room to her bed in the far corner. Since that time about six weeks ago she has also been weird at other doors entering this same room. It is an old house and there is the back door, a door leading to a utility room, a door leading to the sitting room and a door leading to the front of the house. When the lady comes back after leaving Jo at home, the dog won’t go further to meet her than a few feet from her bed, and as the lady approaches she turns back and gets on her bed once more. If the lady goes in the sitting room, Jo will now no longer go in with her but will creep in to join her later. When the lady gets up to go back into the kitchen dining room, Jo goes no further than the door. Front feet over the threshold, back feet in the sitting room, she hovers, just as she does at the utility entrance. The lady just leaves her now and eventually she will hear the dog suddenly shooting around the edge of the quarry-tiled room to the safety of her bed. She has left nail marks on the floor as she skids in her desperation to get there quickly. It is like this room is haunted in some way. The dog has built up a fearful ritual of waiting/hovering in doorways and then making a dash round the edge of the room for her bed, as though there is an invisible monster lurking in there ready to pounce on her. Most of Jo’s odd behaviours only takes place in the presence of the lady. The cleaning lady looks after Jo sometimes and she is fine with her. She runs to welcome her at the door and displays none of these behaviours at her house. 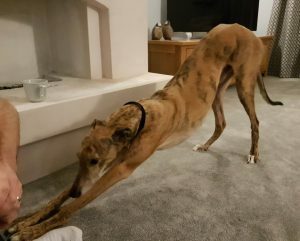 Apart from on her bed where you can see she is totally relaxed, Jo also feels safe in the garden which is the only place where she ‘lets her hair down’ and rushes about – leaping over the pond and having her own mini racecourse! She is happy to have the lady with her when she’s outside. Indoors there is one room she feels safe with the lady – a little office – a room that doesn’t lead off the kitchen. Because Jo reacts in a much more relaxed way and with more enthusiasm to other people that she knows than she does now with her owner, it is clear that for some reason the problem is specific to the lady. She seems unafraid of the doorways and gap between kitchen and dining room when it’s the cleaner coming in. We need a two-pronged approach. First to ‘exorcise’ the room of its demons so that it represents good stuff and not fear, and we need to rebuild Jo’s trust and respect for the poor lady. All force must be abandoned so Jo can make her own choices, and the lady will now be liberally using food for ‘lacing the environment’ to exorcise the room – sprinkling and hiding tiny tasty bits all around the kitchen dining room and then keeping well out-of-the-way and out of the picture while Jo forages and hunts. The lady will also use food whenever Jo comes to her, even if she was coming anyway, or when she follows her. She will use food whilst doing lots of going in and out through doorways – starting with the comfortable door into the tiny office. I’m sure if the lady is able to do these things and for long enough, she will re-build her old relationship with her lovely dog who then will no longer be a dog who refuses to come in and the room will no longer be ‘haunted’. As with any sudden change in behaviour, it is also important to have the dog checked over by the vet to make sure there is nothing physical going on. Great news. Just over two weeks have gone by and the lady has been following the plan closely – and Jo is back to her old self. The room has lost its ‘ghost’. Jo walks in and out happily. There is no more hanging back at doorways and she and the lady are once again enjoying one another’s company in the house. NB. The precise protocols to best use for your own dog may be different to the approach I have worked out for Jo, which is why I don’t go into exact details here of our plan. Finding instructions on the internet or TV that are not tailored to your own dogs can do more harm than good. One size does not fit all. If you live in my own area I would be very pleased to help with strategies specific to your own dog (see my Get Help page). 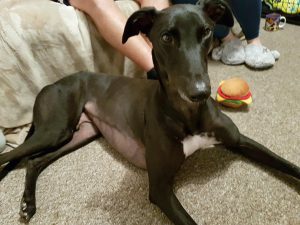 William is a three-year-old Lurcher, or maybe a Greyhound, who came from Battersea Dog’s Home at four months old. He is inclined to get very excited, very easily. For some of the time two Staffies stay in the same house, and neither are calm dogs, one plays rather too roughly (William isn’t innocent as he usually provokes him) and the other is not a good influence, with plenty of snarling and baring of teeth. A bit like a teenager that has got in with the wrong friends, I feel that much of William’s behaviour has been influenced by them. He has not been learning polite dog-to-dog language and behaviour. He has not practised normal polite interaction and play with other dogs. The owners’ dream is to be able to take William for walks in the park and go on holiday with him, but when he sees another dog he is so wild with excitement and fired up with anxiety, made worse by the reaction of the humans, that he is rearing, lunging and screaming. He has never attacked another dog, just been pushy and over-excited. Never aggressive. The most shocking thing is that the lady, in her very best efforts to give her Battersea dog a good life, has had three people in to help her with her lovely dog. One gave her a prong collar and the other an electric collar. I’m relieved that she never used the e-collar, but just imagine the prongs of the other collar on a skinny Greyhound neck. The way to reverse a particular behaviour is to get to the cause of it and deal with that, not to inflict pain or fear. William isn’t an aggressive dog but he just lacks manners and experience. He needs working on, alone. Much of the human response when he’s been confronted with another dog will have made things worse. It is tragic, because a dog owner who wants to do the very best for their dog has in good faith called in ‘experts’ and basically been told to torture him. I feel that they are now very relieved. Gradual but controlled exposure to other dogs at a comfortable distance, with owners who react appropriately, like proper Leaders and not bullies, will bring things around for William and his family, but it could take quite a long time. 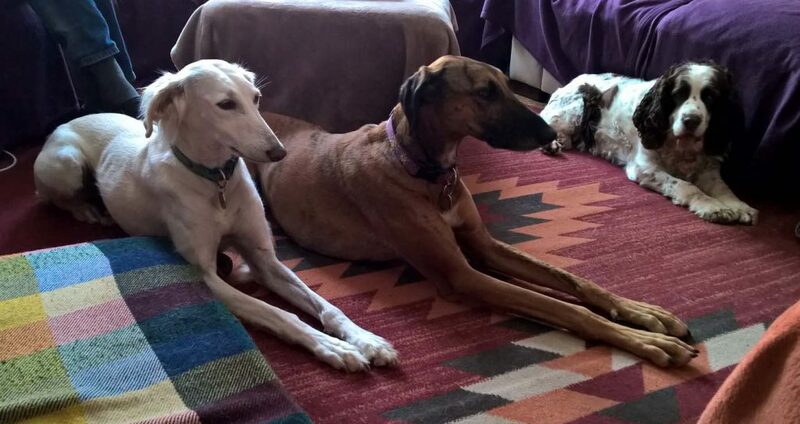 A Lurcher, a Greyhound… and a Hen! This evening I have been to see two beautiful dogs – a lurcher and an ex-racing greyhound who came from Ireland three years ago. 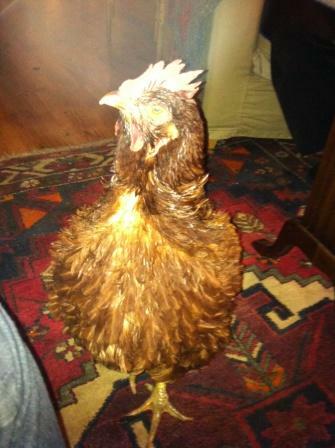 And a red hen. They are all treated like royalty and waited on hand and foot by their elderly owners. What was so surprising was that these dogs were in fact so well-adjusted. There is a bit of grumbling when the lady’s foot may nudge Jessie in bed at night, and Charlie may growl slightly if someone sits next to him on the sofa, Jessie will steal any food she can see (but then she is hand fed from the table) and Charlie barks when they come home (but they make a big fuss of him). The people and dogs seemed happy with the two dogs being King and Queen and the owners being their loyal servants – apart from Charlie’s attitude towards other dogs when out on walks. Having been kennel-bound all his young life, civilised country walks were not something he had grown up with. He is very wary of dogs and his attitude is that he will bark at them and try to get rid of them before they have a chance to attack him – or more particularly Jessie who unlike Charlie loves other dogs. The nearer she gets to them the more frantic and aggressive Charlie becomes. A while ago he bit a man who was trying to protect his dog, so now poor Charlie, who can live in harmony with a chicken in his house, has to be muzzled to protect other dogs – and this will make him feel even more vulnerable. They have a wonderful dog walker who was also at our meeting and who does much of the walking. She is going to help the owners work on treating their dogs a little more as dogs, and dealing with Charlie’s fearfulness with other dogs – so that the lady, in time, will be able to enjoy walking her own dogs together. If you live within my area, would you like me to help you too?